Yours truly! - yesterday afternoon. 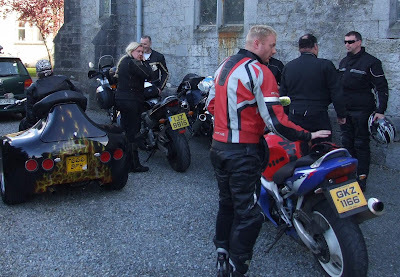 An online buddy of mine is a biker priest from Northern Ireland and he and twenty of his comrades came visiting yesterday evening for a pit stop and much needed sangwidges en route to Kilkenny. 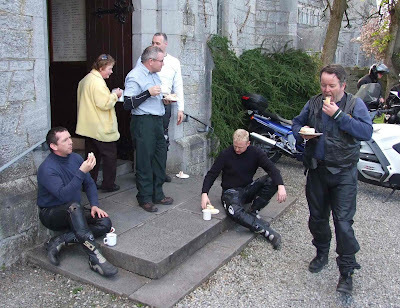 They were doing the tour for Down's Syndrome Ireland and created quite a spectacle when they rumbled into Nenagh. The new look suits you! 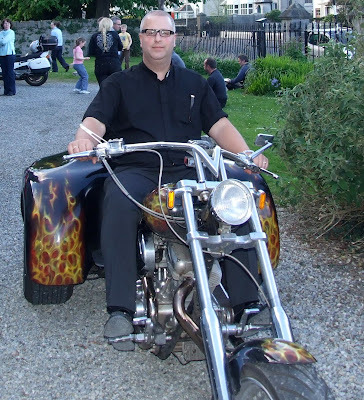 Priests on Bikes is the new Cows with Guns then? How's about the 'Blogger Biker Gang'? Ah for God's sake, this is Father Ted territory.